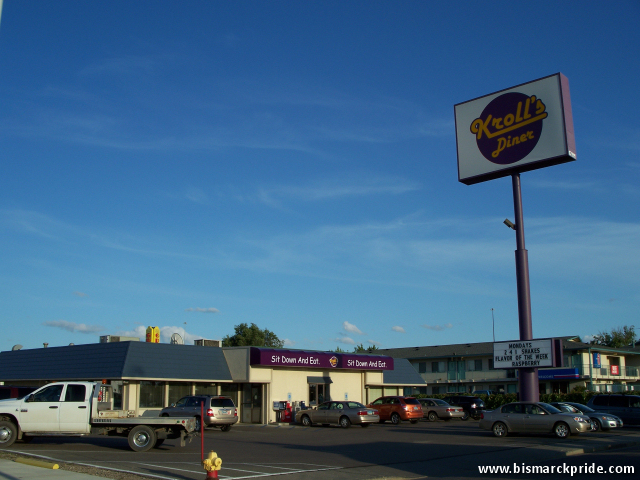 The Kroll's Diner (originally Kroll's Kitchen) in north Bismarck replaced the Roll 'N Pin Restaurant in 1994. Kroll's Diner is a long-time local restaurant with three locations in Bismarck-Mandan, in addition to restaurants in Fargo and Minot. Featuring a wide variety of menu offerings, including breakfast and burgers, Kroll's Diner is perhaps most widely associated for its German entrées, including knoephla soup and fleischkuchle. Kroll's was established as "Kroll's Kitchen" at 1915 E Main Avenue by Mr. and Mrs. Kenneth Kroll in June 1968. Edward Wetsch and Jim Glatt purchased the restaurant in May 1972, when the Krolls moved to Rugby. That location was remodeled and expanded in 1993. A second location, off State Street in northern Bismarck, opened in 1994 after purchasing and converting the former Roll 'N Pin Restaurant. The Mandan location, which features a design and decor reminiscent of classical 1940s-era diners, was the first to carry the "Diner" name when it opened in June 1996.